In seeking to embrace new opportunities for learning in a digital age, what can be learnt from what has gone on before? Ideas about learning as proposed by revolutionary thinkers Dorothy Heathcote and Lev Vygotsky emerged from different eras and discipline areas. However, there are similar concerns identifiable in the writings of both. The question may be asked; does this work still offer insights for supporting learning in another revolutionary age – that of the digital revolution? This paper argues that a consideration of key concepts from Heathcote and Vygotsky’s work does provide the means for understanding why drama is still a powerful learning medium and highly relevant for the digital age. A recent project entitled the Water Reckoning is used as an example to demonstrate some key principles about learning processes in practice. Further consideration is given to the role of the teacher/facilitator in the context of contemporary learning settings and how the role of the teacher as designer and curator has become increasingly important. Drama education, pedagogy, teaching, Vygotsky, Heathcote, socio-cultural theory, zone of proximal development, digital technology, mediation. Vygotsky and Heathcote both developed revolutionary ideas about teaching and learning that emerged from revolutionary times, Vygotsky after World War I and post-revolutionary Russia in a time where that whole society was being remade. Heathcote emerged from the post World War II era and the following social revolution, where ideas about morality, social agency and relationships were being challenged and transformed. They both arrived at some very similar ideas about learning and creativity at quite different times. In the face of the current digital revolution, it can be argued that the work of both offers important theoretical concepts and approaches which are still highly pertinent for informing the work of teachers and practitioners who seek to enable transformative and meaningful learning. Drawing on the work of both this article posits that transformative learning arises through activities and experiences through which people come to see aspects of the world or themselves in new ways, and where the meaning making may lead to changes in consciousness, in beliefs and actions. This paper will present a short summary of the backgrounds of Vygotsky and Heathcote being identifying some key concepts to be found in the work of both. To demonstrate the ongoing relevance of their work, these key concepts are analysed with reference to a drama project which capitalized on using digital tools and platforms. Finally the role of the contemporary teacher is considered in light of the current digital revolution, reconceptualising and extending upon Vygotsky and Heathcote’s work for new revolutionary times. From an early age, both Vygotsky and Heathcote were regarded as very bright, they were avid learners who loved reading and learning. They both had a love of literature and theatre and were noted for their presence and presentation skills. Lev Vygotsky was a Russian psychologist who was born in 1896 and died in 1934. Vygotsky’s daughter recalled his great interest in literature, poetry and philosophy that emerged at an early age (Vygodskaya, 1995). He had a particular interest in theatre and poetry presentations and was known for dazzling recitations of tragic poems as a child. He had a dynamic personal presence and upon his entry to the academic world became known as an inspirational speaker (Moll, 1990). Vygotsky was also a theatre critic and teacher of literature early in his career. His initial academic work focussed on an analysis of ‘Hamlet’ and this was eventually published in the book Psychology of Art (Vygotsky, 1971). He knew about and recognised the significance of Stanislavski’s work and the importance of perezhivanie, motivation and emotions for motivating human activity and meaning making. Vygotksy also wrote several papers on creativity, exploring the creative development of children and adolescents (Vygotsky, 1930/2004, 1931/1998). While Vygotsky did not originally train as a psychologist, he rapidly emerged as a leading thinker within the realm of Soviet psychology, regarded as something of a genius and even the ‘Mozart of Psychology’ (Toulmin, 1978). When he died in 1934 he left a significant body of work that had not been published and much of it was suppressed for over thirty years. Consequently the majority of his work did not get translated and published into English until the late 1970s, 1980s (and since) and the impact of it has since been considerable. Heathcote was born into a Yorkshire mill family of northern England in 1926. The family was not well off, although Bolton reports that Heathcote was a keen learner, a voracious reader and was endlessly curious about the world (Bolton, 2003). She had a particular interest in domains such as English, History and Geography and an early love of performance. She later developed her skills through taking elocution lessons and joining a local performing group when she began working at a mill at age 14. Through a series of fortuitous events she was able to train as a professional actor and build her practice through extensive performance experience. Her future teaching career was triggered when she was told that ‘she was not the right size’ for acting and one of her mentors suggested she would be able to have a career as a teacher. She then became known as an inspirational teacher (Bolton, 2003) who worked with children to ‘make up’ their own plays about things that mattered to them. Significantly she took on fictional roles ‘within’ these improvised dramas and developed the practice of ‘teacher-in-role’ working from inside the drama, as well as outside it. While she never actually trained as a teacher she became a lecturer in education at the age of 26 and taught and influenced thousands of teachers around the globe. Like Vygotsky she was also regarded as being something of a genius. Her particular expression of such was realized through her practice as a master teacher, building on her ability to read a situation, draw on a vast range of general knowledge and to shape and adapt learning contexts and interactions to engage students in meaningful learning. Bolton noted that while Heathcote read widely she did not read academic texts appealing to educationalists, so she did not directly quote Vygotsky’s work in her own. It does appear however from a book the author found in Heathcote’s personal library that David Davis gave Heathcote Mind in Society – the book which includes Vygotksy’s definition of Zone of Proximal Development. While in her writings she may not have explicitly referenced Vygotsky, when you read Heathcote’s work many of her beliefs sound remarkably Vygotskian in nature. Vygotsky, like Heathcote saw the role of the teacher operating within this zone as an important and active one. This role is not one as a neutral facilitator who just supports children’s free exploration, but interacts as a knowledgeable other, involved and intervening, expanding children’s horizons as they co-construct solutions within problematic situations. This is a dynamic zone, with problem solving processes demanding more than just imitating or memorizing certain skills and concepts and applying them. Learning emerges out of active experimentation, problem solving and testing out possibilities. Learning activity within this zone also stimulates internal development processes as students are challenged to extend their conceptual understandings and reflect upon their learning and sense of self. … in the presence of an empowering adult a child can reach beyond his own capacity in carrying out a task. Teacher-in-role enhances this particular adult function. The teacher, through her role, provides a model of high expectations for the enterprise that at first seems out of reach. In time he has no choice but to aim beyond his normal ability – and to break the confines of rigidly held concepts (Heathcote & Bolton, 1995, p. 35). In practice this does not always mean the teacher is operating in role or leading all activity. Heathcote talks of the teacher stepping off the pedestal and making sure decisions rest with the class (Johnson & O’Neill p. 101) with students were given the ‘power to function’ (Heathcote & Bolton, 1995). In her teacher-in-role work she was often able to shift classroom power dynamics, often taking on lower or middle status roles, as well as high status roles, and so be able to call upon participants for input and assistance (Wagner, 1976). Heathcote also acknowledged the importance of the teacher’s role in selecting and drawing attention to material and techniques. For her this was absolutely central to the success of the learning experience. She also elaborated on the importance of choosing dramatic conventions, allowing students the opportunity to become committed to the drama experience, to slow down time for thinking and exploring the implications of decision made (Johnson & O’Neill, 1984, pp.165-6). So what are the implications of this type of active ‘interfering’ role for the teacher operating within the ZPD of a digitally transformed educational landscape? Across educational contexts and settings teachers are encouraged to embrace digital technologies and tools to maintain currency through what has been called the digital revolutionary age (Collins & Halverson 2009). Assumptions are often made about young people having a high degree of skill and confidence in using digital technologies. However, there is a growing body of empirical research that has problematized terms such as digital natives and questioned assumptions about young people and digital creativity (Buckingham, 2007: Livingstone, 2011; Thomas 2011). In major studies in the EU findings have confirmed that while most young people use the internet for information gathering, for personal communications, gaming and entertainment (Mizuko et al., 2013; Ólafsson, Livingstone, & Haddon, 2013), the majority of young people do not engage in significant creative content making beyond uploading photos. So what does this mean for the contemporary drama educator or teacher? If we accept the principles of ZPD, it would suggest that drama educators who wish to work in this digital realm, need to be actively interacting with and selecting the new tools available along with the old. Processes such as modeling and co-constructing are required, working with the digital tools and platforms as well as the human and dramatic to activate young people’s creativity. Furthermore, Vygotsky described some special and specific ways that drama could do this. In Imagination and Creativity in Childhood (1930/2004) Vygotsky outlines the ways that imagination works, discussing the operations of children’s creativity in a number of areas including creative writing, theatre and visual arts. He makes the point that the arts are not the only areas that permit the application of creative imagination, but that in traditional education, “opportunities for children to manifest and develop creative capacity often occur primarily through art” (Vygotsky, 1930/2004, p.86-7). Similarly to Heathcote he makes the link between drama as building on children’s play, which is the original form of drama. He believed that the most creative forms of dramatic activity for children were those where they were involved in creating and realising the drama themselves. While these might be based on an existing piece of literature or story he believed that works that were “created and improvised by them [children] are more compatible with children’s understandings” (p. 72). Through these processes they are able to experiment and implement imaginative activity. Drama and play allow children to operate in multiple contexts at once, enabling a duality of experience and affective response. This is the power of drama as it can provide life-like experience, and possibilities for being, for creation and experimentation in a zone that is protected from the consequences of the real. Through the arts and drama therefore, it is possible to explore human experiences, ideas and emotions, and rather than doing that as an observer or receiver of knowledge to do so as a participant having an actual experience within a ‘what if’ frame. The power of these types of opportunities remains potent, in an age where the sheer volume of information and experience available can be daunting. Opportunities to focus, explore, to make sense of experience and take action may be more relevant than ever before. How these principles play out in practice will now be examined in regard to the Water Reckoning project. The Water Reckoning project was developed as a version of a Rolling Role drama in education project, Rolling Role being a pedagogical model developed by Heathcote in the 1980s and 1990s. The project was proposed by Pam Bowell at the 2012 IDIERI (International Drama in Education Research Institute) conference as a fitting tribute to share at the Heathcote Reconsidered Conference the following year. The proposal was that drama education researchers, secondary school drama teachers and their student groups engage in a project that sought to revisit the strategy of ‘Rolling Role’ for a digital age. A project team was formed which consisted of several drama education researchers. Over a twelve-month period this group expanded to include site-based teachers and together they planned and implemented what became known as The Water Reckoning project. The Water Reckoning Project was enacted across five school sites in four countries (Australia, Greece, Singapore and the USA). It involved the use of embodied classroom experienced, using digital technologies for capturing and sharing creative work, networked communications and performative acts (see Davis & Simou 2014 for further detail). Rolling Role can be seen as a model with great relevance for the current digital age as a model for promoting collective creative activity and transformative learning. Rolling Role generally involves a number of classes exploring different aspects of experience within an imagined community, collectively building the details of a place with a history. The initiators create a common context and agree to the key features, affairs and concerns of the community. There should be a central tension that impacts on all the different contexts and the community faces some kind of change. The students/children are involved in a series of linked experiences, and within each session some artefacts and texts are usually created. The way the project ‘rolls’ is that work is often left incomplete, but published and shared, so another group can take it forward and continue the drama (Heathcote, 2002; Heathcote & Mills, 1993). In seeking to facilitate transformative learning, one of the goals for the Water Reckoning project was to explore important sustainability issues through a drama-based program. The underlying belief was that the use of drama would be appropriate for engaging students to explore real life issues through the protective frame of the fictional context. This particular project therefore focused on exploring ideas that related to the UN Year of Water Cooperation in keeping with Heathcote’s concern for using drama to raise awareness about ‘learning that matters’. The drama explored water issues such as ‘how do humans deal with situations such as drought or extreme weather events?’ These were explored through the collective creation of a fictional culture’s history, but with the intention to draw upon local experiences of water crises and cooperation. Such experiences were very relevant at the time of the project, with a series of cataclysmic weather events occurring in most of the countries involved. The goal was to explore shifts in attitudes and perspectives as students worked to ‘devise alternative modes of action, alternative projects and solutions’ (O’Neill in Heathcote & Bolton, 1995, pp.vii-viii). In the early phases of the project planning some parameters were determined about process, participating groups and the content for the project. An examination of these begins to signal the parameters of the ZPD. Firstly the form and content for the drama indicated new parameters for the ZPD. Teachers indicated that most of their students had minimal experience in process drama and that previously students would more likely have experienced units of work that were centred on a particular genre or style of theatre, on playbuilding or on script interpretation. The content or thematic focus on sustainability issues was also not something that was common practice, and teachers were not sure how to do that through drama without taking a didactic or transmissive approach. The second main area of movement in the parameters of the ZPD was in shifting from single site planning and implementation to a collaborative process utilizing digital tools and platforms. Even teachers who were working in sites with more than one drama teacher said that their opportunities for joint planning and sharing work were limited. Their experience of using digital platforms for communicating and sharing work across sites was also not extensive. It is therefore possible to create a matrix of the ZPD for this project and the trajectory for learning. 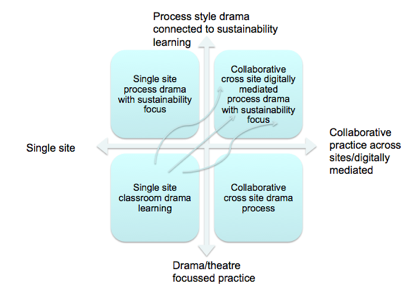 In Figure 1 the matrix depicts the key shift in practice from single site process to a collaborative, digitally mediated process on one axis, and the shift from typical drama/theatre specific practice to that focused on process drama about sustainability issues on the other. The arrows indicate the direction of the learning process and how that learning moved across these different aspects as the process unfolds. Using the matrix as a tool helps highlights possible areas for contradiction that may call for careful consideration in the planning process. Considering how to use digital technologies for recording and sharing classroom work, what can the teacher do, what can the students do and how to incorporate that in the drama process. Some of the means for addressing these concerns could be found through the selection and curation of various mediating artefacts, objects and digital platforms. The concept of mediation was central to Vygotsky’s work and writings and also to that of Heathcote’s practice and so it is now important to explore that in more detail. Vygotsky and Heathcote both identified the key role of mediating tools and signs within human activity, for imaginative work and for learning. One of the significant shifts in Vygotsky’s psychology, compared to previous work, was his identification of the important role that mediational tools play for humans acting within and upon the world (Vygotsky, 1978). Human subjects engage in the world enacting motives or what are called objects. The object or idea of what a person wants to achieve may be held within a subject’s mind, however, realisation of this relies upon mediation through various means – these are variously called tools, instruments, artefacts and signs. 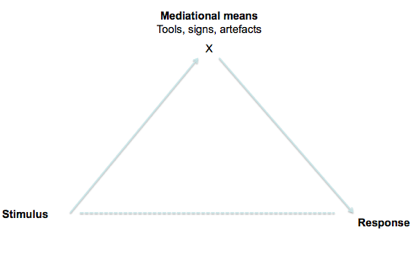 The mediation instruments or means may include physical tools and artefacts but also culturally learned processes and more internally oriented signs such as language. Vygotsky’s initial representation of this foundational process includes a triangle with S representing stimulus on the left, and R on the right (for response) with an X at the top to represent the mediating means. A version of that is shown in Figure 2. In considering the drama process it is possible to identify many layers of mediating tools involved. For a start the drama process itself is a learning ‘medium’ or mediating means. Significantly the first book written about Heathcote’s practice was called “Drama as a learning medium” (Wagner, 1976) Heathcote recognizing the fundamental shift that occurs once you work within a dramatic context. Through creating a context of ‘what if’, a shift is made from the constraints of ‘real life’ to the pretending function. This can enable a certain flexibility in exploring responses not possible for people in ‘real life’, as there they have to live with the consequences of their actions. The dramatic process is therefore a foundational mediating means or ‘tool’ but it also involves high selectivity in the selection of specific content and texts, narrative frames, conventions and processes – these can all be considered as ‘tools’ or aspects of the mediating means. Heathcote paid close attention to all aspects of ‘signing’ and what are essentially the tools of mediation. She would often create concrete tools and artefacts (maps, paintings, letters, photographs and so on) within a drama – to signify and inform and ‘help crystallize belief’. (Wagner, 1976, p.71). The importance of selecting and designing the mediating means and tools was also highly important to planning and implementation of the Water Reckoning project and major planning decisions will now be identified. There are many layers of mediating tools and signs used in any drama process, let alone one that is also focused on cross site collaboration. It would be possible to write a whole paper about identifying and describing all of those involved and decisions made regarding the selection, creation and use of each. However for the purposes of this article several examples will be selected. These focus on two areas crucial for negotiating movement across the field of the ZPD, the selection and use of digital platforms for collaboration, and the artefacts and tools used for negotiating movement into the thematic matter, form and process. For the teachers and researchers planning the project, communication tools such as email and Skype were the first used for general planning and discussion. Planning processes were negotiated through collective editing tools utilizing a Google drive folder and a Google+ community. This tool also enabled the sharing of images, video clips and music that could be used in the creative process. As decisions were made about what would be most useful these were then posted onto a project website that was set up (http://www.water-reckoning.net). It was also important to find an online collaborative tool to be used for video-conferenced planning and also live interactions between project sites with students. Google hangout was the application adopted for these live communications sessions. Another tool was used for creative sharing and archiving, that being PlaceStories (http://placestories.com). This platform allows members to create their own virtual project spaces and share different media such as videos, audio, texts and images. Therefore considerable effort was devoted towards decisions regarding the choice and selection of mediating tools that could facilitate communications, collaboration and creation. What is important to note in terms of project implementation was that the project teachers and researchers often found that they themselves took on the role of recorders, documentors and digital editors. While the use of digital technologies within the drama process contributed to participant interest, engagement and meaning making, in terms of students learning about and creating mediated content, their interest was more focused on ‘doing drama’ not making media. 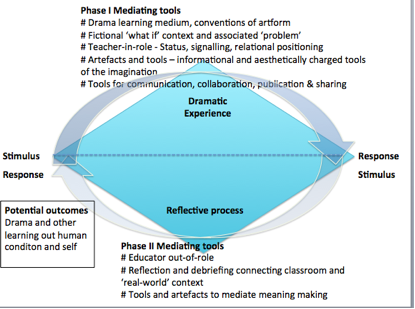 The process of finding and creating the mediating artefacts or pre-text tools to initiate the drama was crucial and involved an extended process (see Davis & Simou 2014). The context and pre-text materials needed to allow participants to look at real life issues but through a frame removed from the immediate and real, perhaps through a historical example or frame. They should also be aesthetically engaging. What was selected was an existing video and set of images, around which a fictional frame was created. The video and photographs used depict work from underwater sculpture parks created by artist Jason deCaires Taylor (http://youtu.be/vKxrVmfU3-E). These depict sculptures of people in everyday settings but which evoke many other layers of possible meanings. This and other photographic evidence of his work provided a set of artefacts that were rich aesthetically and conceptually. This material was complemented by the creation of an additional fictional frame and together these set up the dramatic ZPD. The dramatic premise was that the sculptures were from the remains of a lost city, a community called Ardus Unda, (drawing on the Latin words Ardus – meaning water or difficult, and Unda – meaning water, ripple or wave). The community had faced a time of devastation which had been triggered by water-related events. A linking artefact was created – that of a message in a bottle – and this suggested that the statues were actually people ‘frozen in time’. Questions were then posed regarding who these people might be, what happened to them, could anything have been done to prevent what happened and what messages might they have for our world and the future? Photographs and a video message were then among the pre-text materials used to launch the drama, and initiate movements between the real world of the participants and the world of the drama. In some respects these mediating tools and means can be conceived of as boundary crossing tools. These tools are of particular importance as they may carry meaning but also acquire meaning throughout the process. The boundary crossing tools may also assist in generating participant commitment to the world of the drama and may assist in the development of participant understandings. 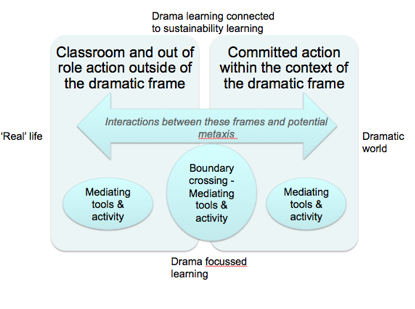 Certain mediating tools and activities could be seen as being situated predominantly within the world of the classroom or the dramatic world, but some of the most important ones were those that provided the bridge between both (see Figure 3). It may be helpful to provide an example of how some tools worked as boundary cross tools. In the launching phase of the project one of the photographs used included one of a group of women standing in a circle, all facing outwards, as if in a gesture of defiance or strength (http://www.underwatersculpture.com/sculptures/viccisitudes/). Throughout their recreations of the image, participations created new interpretations, histories and understandings related to the images. Some of these understandings related to the ways that people may gain strength from each other in times of crisis, even when all hope may appear lost. These new understandings, which the participants created for themselves, had the potential to shift their understanding beyond the realm of the drama and inform their evolving understandings of themselves, and appreciation of the complex issues facing humanity. These forms of understanding and this possible experience of metaxis (see Boal, 1995 and O’Toole, 1992) are often some of the most interesting and powerful that can emerge from a drama. They are also important in considering the role of drama for transformational learning. The nature of reflection and internalization processes for shifting between external experience and perception, to internal understanding and meaning making is described Vygotsky and Heathcote’s work. Vygotsky proposed that higher psychological functions appeared on two planes, first on the social plane between people as an interpsychological category, and then within the individual child as an intrapsychological category (Vygotsky 1978, p.57). Therefore the teacher’s role must also include a concern for assisting this process. It means incorporating phases of reflection – both within action and on action – to clarify meaning and consolidate concept formation. This can occur through dramatic processes as well. For example, one of the most significant ways this occurred for the Water Reckoning project was when at the end of the project, students in-role as inhabitants of Ardus Unda, recorded their message for people of the future. Many of these messages encapsulated quite profound insights that students had developed throughout the course of the project. To draw together features of this dramatic learning process and the range of mediating means and tools involved, two arcs of activity are identified. In Figure 4 the arc at the top shows the dramatic experience primarily operating in building the dramatic world and encounters. The second at the bottom depicts the reflective process that is important for shaping experience into meaning making. The positioning of the reflective arc does not mean that it is separate from the dramatic encounter, but often it does require a halt or slowing of the dramatic action, to take a step back, or outside the drama to explore the implications, the possibilities and the meaning of what has occurred. These processes are not new in themselves, but in considering learning within the digital age, it seems apparent that teacher drama teacher or leader becomes an even more nuanced designer and curator of these aesthetic encounters. Teachers who wish to be effective in this landscape need to add to their tool-kit and consider an even wider range of mediating tools and means alongside the others that have long been available. As we consider the nature of teaching and learning required for the current revolutionary age it is worth revisiting what master teachers and thinkers discovered in past transformative eras and to consider what might still be relevant and can be extended upon. There is much that is still relevant in the work of leading practitioners and theorists such as Heathcote and Vygotsky, who shared some similar beliefs about learning and teaching although emerging from very different cultural contexts. Vygotsky and Heathcote both understood the power of the arts and drama for learning, and the type of learning that could change people, their worlds and the future. The power of drama remains potent now, especially when artfully used to open up the possibilities for personal and collective learning. The role of the teacher or facilitator in this process is an active one as they structure a zone of proximal development, working within the encounters, at times leading and at times following the direction of the students. Of increasing importance is the careful selection and orchestrated use of a range of mediating ‘tools’ – conceptual, physical, technological and relational. In considering implications for a new ‘revolutionary’ age, the active role of teacher remains crucial in designing and shaping aesthetic encounters, opening up the spaces for student creativity, and negotiating transformative learning and meaning-making. Boal, A. (1995). The rainbow of desire: The Boal method of theatre and therapy. Abingdon, Oxon: Routledge. Bolton, G. (2003). The Dorothy Heathcote Story: Biography of a Remarkable Drama Teacher. London: Trentham Books. Heathcote, D., & Bolton, G. (1995). Drama for learning: Dorothy Heathcote’s mantle of the expert approach to education. Portsmouth, NH: Heinemann. Heathcote, D., & Mills, C. A. (1993). Rolling Role & the National Curriculum. Newcastle Upon Tyne: Audio Visual Centre, University of Newcastle Upon Tyne. Johnson, L., & O’Neill, C. (Eds.). (1984). Dorothy Heathcote: Collected Writings on Education and Drama. Evanston, Illinois: Northwestern University Press. Mizuko, I., Gutiérrez, K., Livingstone, S., Penuel, B., Rhodes, J., Salen, K., . . . Watkins, S. C. (2013). Connected Learning: An Agenda for Research and Design. Irvine, CA: Digital Media and Learning Research Hub. Moll, L. C. (Ed.). (1990). Vygotsky and Education: Instructional Implications and Applications of Sociohistorical Theory. Cambridge: Cambridge University Press. Ólafsson, K., Livingstone, S., & Haddon, L. (2013). Children’s use of online technologies in Europe : a review of the European evidence base. London, UK: EU Kids Online Network. Thomas, M. (Ed.). (2011). Deconstructing Digital Natives New York & London: Routledge. Toulmin, S. (1978, 28 September, 1978). The Mozart of Psychology. The New York Review of Books, 25, 51-57. Vygotsky, L. S. (1930/2004). Imagination and Creativity in Childhood. Journal of Russian and East European Psychology, 42(1), 7-97. Vygotsky, L. S. (1931/1998). Imagination and Creativity of the Adolescent (M. J. Hall, Trans.). In R. Reiber (Ed. ), The Collected Works of LS Vygotsky: Volume 5, Child Psychology. New York: Plenum Press. Vygotsky, L. S. (1971). The Psychology of Art. Cambridge, MASS: MIT Press. Wagner, B., J. (1976). Dorothy Heathcote: Drama as a Learning Medium. Washington DC: National Education Association of the United States.